What makes a more promising lead: a stranger routed to you by a third-party website, or someone introduced to you by a friend? The answer may seem obvious, but the difference in quality between those types of leads can be hard to put a finger on. A recent survey of real estate executives by real estate marketing firm Imprev has shed some light on the issue, finding that the gap in quality between leads acquired through relationships and leads generated through third-party websites is more like a chasm than a ditch. The online survey was administered in late October, with 276 leaders of real estate companies that were involved in nearly one-third of 2013 home sales participating, Imprev said. Imprev says the takeaway of the survey is that real estate agents should make sure they’re spending enough time nurturing referrals or past clients. It should be noted that Imprev’s business revolves around helping agents do just that. 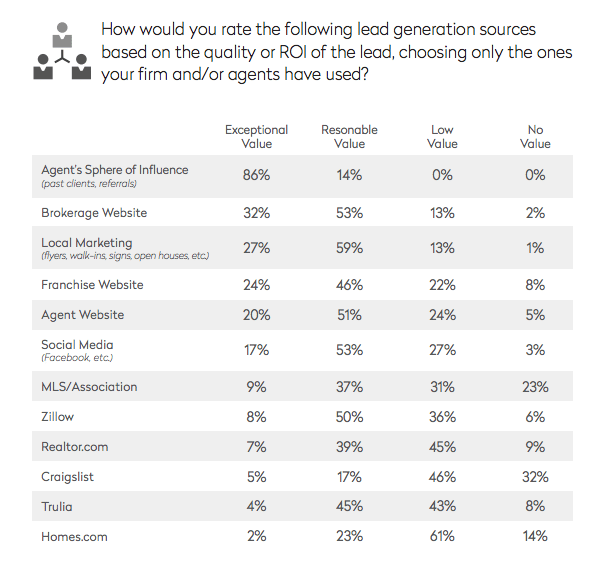 Less than 10 percent of respondents indicated that Zillow, realtor.com, Craigslist, Trulia or Homes.com along with websites powered by multiple listing services or associations produce leads of “exceptional value” based on “the quality or ROI” of leads coming from those sources. By contrast, 86 percent of respondents said leads who are past clients or referrals — those within an agent’s “sphere of influence” — produce exceptional value. Respondents were also more likely to say that leads from brokerage websites (32 percent); local marketing (27 percent) such as fliers, walk-ins, signs and open houses; franchise websites (24 percent); agent websites (20 percent); and social media (17 percent) produced “exceptional value” than leads from third-party websites. Regardless of the quality of leads available to real estate agents, agents often spend a better chance at converting all types of leads into clients by engaging them, rather than sitting idly by. But this can be a challenge, according to the Imprev survey. 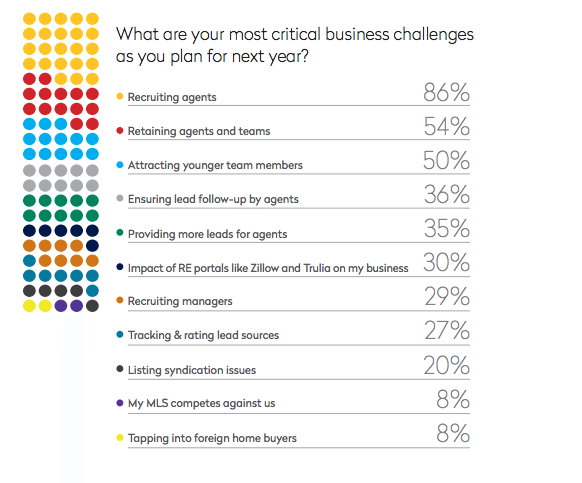 After personnel issues, (recruiting agents, retaining agents and teams, and attracting younger team members), “ensuring lead follow-up by agents” (36 percent) was the most often cited “critical business challenge” faced by respondents. Victor Lund, co-founder of real estate consulting firm WAV Group, noted that studies showing low rates of adoption of customer relationship management systems (CRMs) also suggest real estate agents aren’t as focused as they could be on cultivating leads. Lund said Imprev is not a WAV Group client. Article image credited to Introductions image via Shutterstock.